There have been many point of views about being genius. 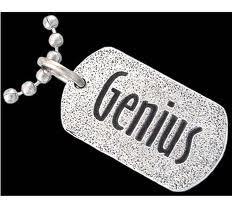 Some think people are born genius, and many other feel that one can with effort become a genius. Keeping these point of views aside, there are certain qualities and thinking patterns that genius people follow. And if any common man focuses or shifts his attention to these qualities and works out on improving those qualities and aspects even they can become genius. Let us have a look at them. 1. Genius people have good observation skills they are expert observers and apply the lessons they learn form one situation to another. 2. Genius people go deep or into the root of the problem and ask themselves right kind of questions that lead them to solutions. 3. Genius people don’t stick to routine and same thinking, they think and analyze from various point of views. 4. Genius people live in the very present and in the very moment. They focus all their energies and attention in the present moment and in what they are doing. 5. Genius people never hesitate to have kind of thinking pattern that ordinary people consider crazy or just impossible. So, these are the factors that make genius a genius and if we intend to become so, we have to focus on improving those qualities and aspects. Go ahead and give it a try.